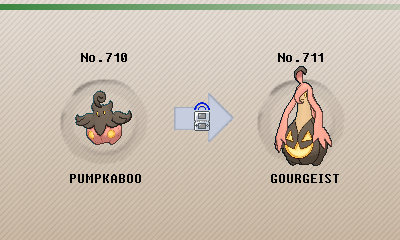 Gourgeist, The Pumpkin Pokémon. Singing in eerie voices, they wander town streets on the night of the new moon. Anyone who hears their song is cursed. It enwraps its prey in its hairlike arms. It sings joyfully as it observes the suffering of its prey. 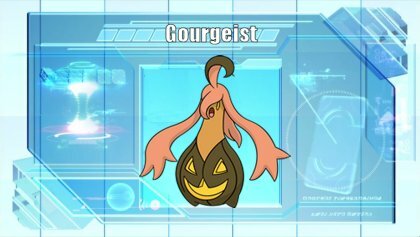 Gourgeist is an interesting Pokemon, coming out as a strong option at the start of XY due to its good stats but having fallen very far not too long after. Gourgeist is still a strong pivot in lower tiers with its Grass typing and good move options from the Ghost typing, but it's not a very strong type combination for a slow defensive Pokemon in higher tiers outside of a few niche uses. Gourgeist also brings an interesting mechanic to the game with the size variants, but there is no real reason for a size other than Super due to its better stats where it matters competitively. Typing - Grass/Ghost is solid typing allowing Gourgeist to resist a lot of lower tier metagame threats and be a bulky pivot. This typing gives Gourgeist resistances to Ground, Fighting, and Normal which are quite common as well. Stats - While Gourgeist has great Attack, HP, and Defense, its Special Defense and Speed leave a lot to be desired. 54 Speed isn't too bad for a defensive Pokemon but leaves Gourgeist with a large portion of the metagame outpacing it, while its Special Defense is low for a Grass-type, especially with many super-effective moves against it coming from the special spectrum. Frisk - Reveals opponent's item on switching in - A good ability overall, this allows Gourgeist to scout some Pokemon and can remove the surprise factor of some wall breakers that might be carrying a Z-Crystal. Pickup - Sometimes finds an item after battle, can pick up an item consumed by foe or ally during battle - An in-game ability with very niche and unreliable competitive use, never use this. Insomnia - Prevents sleep - A solid ability overall, though the buff to Grass-type Pokemon makes this less useful due to Gourgeist being naturally being immune to Sleep Power and Spore, the best options for putting something to Sleep. Gourgeist sells itself as a strong physical wall, making out on EVs to further this niche. Will-O-Wisp is a strong move as it halves damage on Gourgeist from most of the physical Pokemon that it will be tanking. Foul Play works with this as it does more damage base on the opponent's Attack and does not factor in the foe's reduced Attack from a burn. Leech Seed and Synthesis are there to keep Gourgeist around, Leech Seed can also help other Pokemon that switch in after Gourgeist to keep up some momentum and ease a switch. Remember, Gourgeist-Super is the best choice for Gourgeist in general so make sure you're using it for optimal results. Frisk is the most useful ability because it will always provide useful information for you, even though it does nothing for Gourgeist itself. Leftovers are self-explanatory, Gourgeist wants to stay as healthy as possible so any passive recovery is helpful for this role. 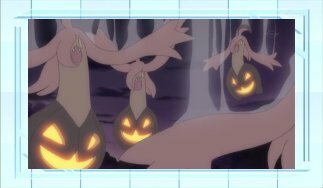 This might look like a complete joke set but Trick-or-Treat can actually have deceptively strong results when used as a Z-Move. Boosting all of its stats by 1 stage while also adding Ghost typing to the foe gives Gourgeist a lot of momentum despite its stats not appearing particularly strong. Seed Bomb is the most reliable STAB move Gourgeist has, providing useful Grass-type coverage. However, Phantom Force provides more powerful coverage as a Ghost-type move at the cost of giving the foe an extra turn to switch into the appropriate check. This does go through Protect though so don't worry about that. Shadow Sneak provides useful priority to pick off a weakened foe or get one last hit in before going down. Regular Gourgeist is the best choice if using this set, since it offers the best combination of Attack and Speed. Gourgeist isn't particularly strong or fast before boosting, so it wants as much Attack as possible from an Adamant nature. This is not nearly as useful as the defensive Gourgeist-Super set, but if you're looking to be festive then this is the set for you. Colbur Berry - An option to help Gourgeist handle Dark-type moves so it can better tank Pokemon such as Absol until Will-O-Wisp is applied. This also slightly reduces the damage it would take from an initial Knock Off otherwise. Trick Room - This is usually difficult to justify since Trick Room is tough to make use of unless the setter can abuse it, but it can provide valuable support in certain formats such as Battle Spot Singles. Lanturn - Synergizing well defensively, Lanturn is a nice bulk partner to combo with Gourgeist. Lanturn is able to sponge most special attackers, especially the attacks that are a problem for Gourgeist such as Flamethrower and Ice Beam, while Gourgeist can sponge up Ground-type attacks for Lanturn. Audino - With Gourgeist's weakness to status moves, Audino with Heal Bell is a nice option to help keep Gourgeist alive and healthy. Wish passing is also really nice to help keep Gourgeist up while Gourgeist can absorb the Fighting-type attacks Audino draws in. Gourgeist has made a few appearances in the anime. 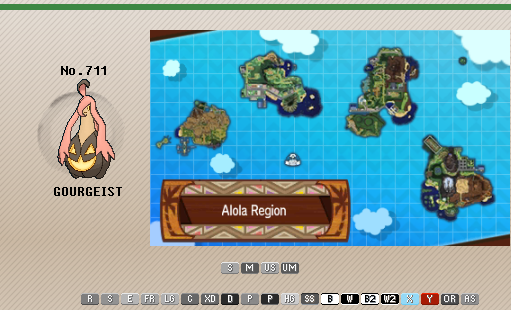 Most notably, it was used by Jessie during her travels through the Kalos Region.